Regular appointments to your dentist twice a year are critical aspects to preventive health, even for young children. Everyone, no matter their age, needs to visit the dentist twice a year for preventive care. However, many parents are usually not too sure when their child needs to see their children’s dentist in Oklahoma City for the first time. The American Dental Association recommends children see the dentist for the first time before the age of two. When bringing your child in for the first time, choose a dentist who can care for your entire family. One of the most frequently asked questions among parents in our practice is how can I make sure my kids will always take care of their teeth? Our answer: start early! Oklahoma City Children’s dentists Dr. Collin Holman and Dr. Jon Holman recommend getting children accustomed to oral hygiene at home and in our office as soon as possible. 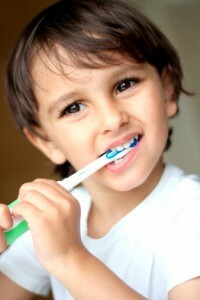 An early start can help set your children on the path toward a lifetime of good dental health. As parents, we all know that sometimes we must make our kids do things they’d really rather not do. Like do your homework, or take a shower, or be nice to your sister, or go to bed—the list goes on and on. In most cases, a little child psychology can be helpful. A few tricks to get kids do they have to do won’t hurt them. To the contrary, it will probably help them. With this in mind, Drs. 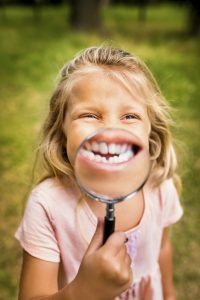 Colin Holman and Natalie Frazier and their team of dental hygienists and dental assistants at Dental Expressions in Oklahoma City, OK, would like to offer a few tips to help you help your children have healthy teeth and gums. Your child’s smile lights up your world every day; though it is no doubt as beautiful as it is cherished, is it healthy as well? Believe it or not, those little pearly whites need just as much attention from the dentist as adult teeth do. 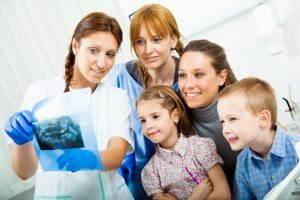 At Dental Expressions in Oklahoma City, OK, Dr. Holman and Dr. Frazier offer a comprehensive range of general and family dental solutions, including children’s dentistry. Tooth decay is the single most prevalent childhood disease in America; in fact, it is four times more common than early childhood obesity and 20 times more common than diabetes. Cavities, also known as dental caries, are caused by the acid-producing bacteria that accumulate on teeth and beneath the gum line. While brushing and flossing at home are certainly integral parts of any healthy oral hygiene routine, the only way to fully control plaque and bacteria is to visit the dentist at least once every six months beginning around the age of three or four. You may wish to bring your child to our office prior to this age, particularly if you notice anything out of the ordinary or have cause for concern. As always, our team is here for you and your family, standing by to answer any questions you may have about your little one’s smile. During a routine checkup, our doctors and staff will closely examine each surface of your child’s teeth, inspecting even between teeth to rule out the existence of damaging cavities or symptoms of gum disease. We will perform a thorough cleaning as well, offering helpful homecare tips so you can maintain your child’s smile properly between visits. Our doctors may suggest fluoride treatments to fortify your son or daughter’s vulnerable enamel and sealants to help ward off tooth decay. With children’s dentistry at our family-friendly office, you’ll find everything you need to keep those precious little smiles looking and feeling their absolute best. 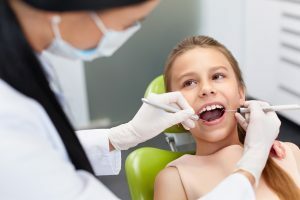 At Dental Expressions, we understand that many children may feel slightly uneasy in an unfamiliar place, particularly in a dental office where there are innumerable new sights and sounds to experience all at once. This is why we specialize in ensuring that even our youngest patients feel absolutely comfortable and relaxed from the moment they enter our office. We want to lay a sturdy foundation for a lifetime of optimal oral health, and we do so with gentle, effective, and personalized children’s dentistry services, all of which are performed with genuine care and a warm, welcoming smile. If you’d like to experience the Dental Expressions difference for yourself, we encourage you to contact our office in Oklahoma City, OK today to schedule your child’s appointment. Our team would love nothing more than to serve you as a member of our own dental family. Our conveniently located practice is privileged to serve families from throughout OKC and the surrounding areas, including Norman, Midwest City, Moore, and beyond. 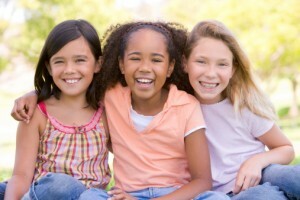 Every year in February, the American Dental Association celebrates National Children’s Dental Health Month. At Dental Expressions in Oklahoma City, OK, Dr. Colin Holman and Dr. Natalie Frazier observe the annual event as well, emphasizing the importance of quality dental care beginning at a young age. Our comprehensive menu of children’s dental services keep your child’s teeth and gums looking and feeling great, building a strong foundation for lifelong oral health. We Love Your Child’s Smile! When kids are young, their minds are like sponges; they take in the world around them and learn how things work at an appalling rate. This is among the many reasons that it’s so important to introduce them to the world of oral health and hygiene as early as possible – an ideal time is typically around two years of age. When your child comes in for his or her first visit to Dental Expressions, we’ll provide a fun, engaging and welcoming experience that sets the tone for pleasant appointments in the future. Aside from examining and cleaning your child’s teeth and gums, we’ll look for any signs of decay or other problems and provide corresponding treatment as necessary. Fluoride treatments are extremely useful for fortifying young, newly developed teeth and sealants help protect against cavities. If your child plays sports, we can even create a custom athletic mouth guard to defend against injuries while they play. 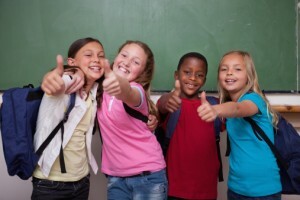 Our goal is to preserve your child’s precious smile and to get them excited about their dental health! Though keeping your child’s teeth healthy and strong is a priority all year round, we think that National Children’s Dental Health Month is an ideal time to get a great start for 2014. Contact our office in Oklahoma City, OK today to find out how our caring, compassionate team can help protect and preserve your child’s smile with our comprehensive children’s dentistry services. We also proudly serve families from throughout the surrounding communities, including Norman, Midwest City, Moore and beyond. We look forward to giving your little ones something to smile about!